Marc is a BHF funded PhD student whose research focuses on applying the latest analytical techniques to explore the space outside of our cells (the extracellular matrix or ECM) in different vascular tissues. ECM proteins have been shown to be involved in many diseases that affect our blood vessels. Evidence suggests that long-term alterations to the ECM plays a critical step in the progression of these disorders. Therefore, it is important to characterize the changes that occur in diseased vessels and uncover the underlying mechanisms of disease. Ultimately these developments may lead to the discovery of novel prognostic and diagnostic markers while elucidating potential therapeutic targets. 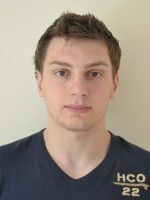 Marc received his MBiomedSci from the University of Ulster (Northern Ireland) in 2014; in which time he spent 1 year as a research scholar in Prof. Loren Field’s lab, Indianapolis, U.S.A. After returning to the UK, Marc joined King’s College London and is in his second year of a 4-year BHF MRes/PhD.